Work in the classroom as a team member. Plan curriculum- circle time, weekly progress notes, conduct conferences with parents twice a year. Break other staff members in other classrooms. We provide benefits like 401K, Paid time off, Medical and dental. A minimum of 12 ECE units. Bachelor's and Masters degrees preferred. CPR certified within the last 2 years. 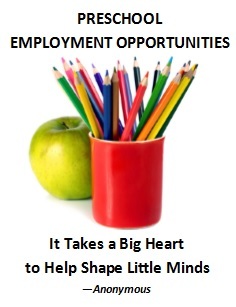 Call to schedule an interview at (925) 743-4187.